Coming from someone who at one time could barely even think about tofu without wincing, we sure have come a long way now, baby. Another food feature of cute Colin's birthday this past August 3rd involved a lunch of banh mi, a traditional Vietnamese style sandwich. 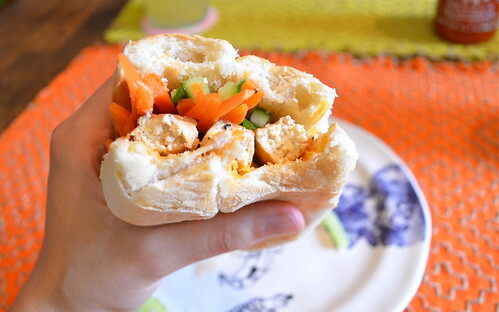 Though banh mi is technically the Vietnamese term for "bread" (already in, guys), this sandwich, despite being wrapped in a traditional crusty baguette, is so much more. If you remember to do it, it's best to prep your tofu and carrot-cucumber combo up to a day in advance. In a pinch, 1-2 hours ahead of time will do. Any less than that, and you're running the risk of a lack of flavor and saturation. 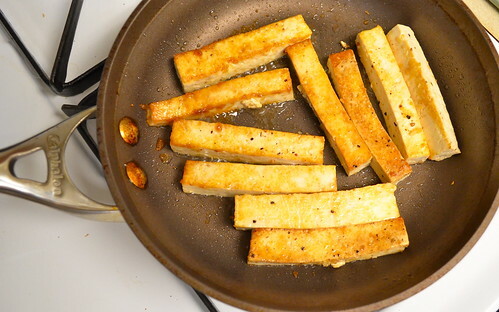 Begin by prepping your tofu: after being firmly pressed (again, as far in advance as possible in order to ensure getting rid of any excess moisture), cut into one-inch strips. Place in a bowl and evenly coat with 1/3 cup brown sugar and 1/3 cup soy sauce. Toss to coat evenly and top with a sprinkle of both salt and pepper. Cover and refrigerate for up to one day but at least one hour before cooking so that your tofu can marinate. Meanwhile, you can start prepping your vegetable slaw topping, which will give your sandwiches a nice fresh punch with a hint of sour from the vinegar. 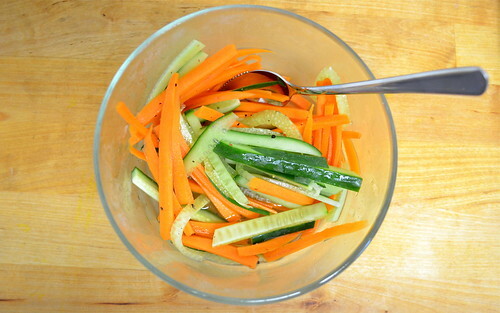 Toss your thinly sliced and shredded veggies in another bowl with the rice vinegar and 1 tablespoon of brown sugar. Add a large pinch of salt, cover and refrigerate for one hour or up to one day before serving. When you are ready to cook your tofu and assemble your banh mi, heat a small pan over medium heat. Add your sesame (or olive) oil and place your prepared tofu in the pan. The sugar and soy sauce will give the tofu a nice crispy finish on all sides, so be sure to turn evenly and often to make sure the all sides touch the heat of the pan. At the same time, combine your Sriacha and mayonnaise a small bowl: trust me, as primitive as this might seem, it's what makes the sandwich. The creamy and spicy balance each other so perfectly and give your bread a little moisture and a lot of kick. Once your tofu is cooked on all sides, it's time to put this bad boy together. 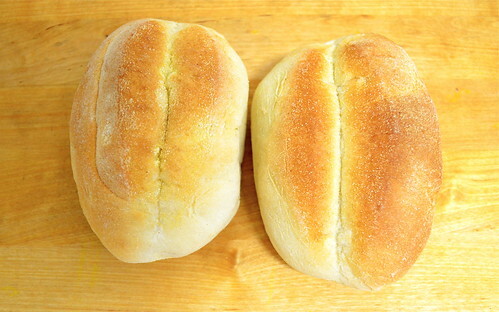 If you want your bread to have a little extra crunch, start by toasting your rolls until heated through. 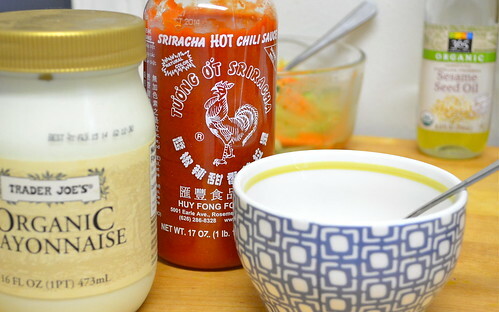 Spread some Sriacha mayo generously on one half (or hey, both if you're feeling daring) of your bread. 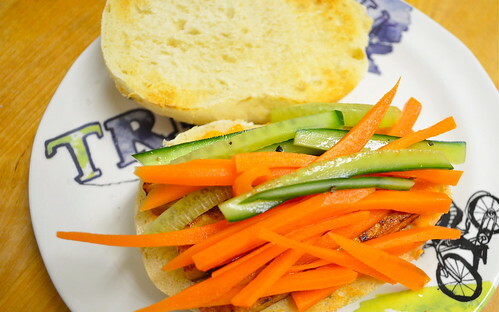 Add four to five tofu strips per sandwich and top with a generous heap of your carrot-cucumber combo. 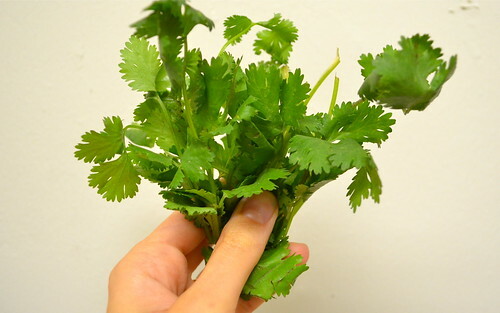 Sprinkle with thinly sliced jalapeño and a few torn cilantro leaves. Though I skipped cilantro on my own sandwich (after a rather unfortunate bout of stomach flu in Mexico, I can't even smell the stuff), this sandwich practically mirrored the authentic version I'd tried only several weeks prior. Such a unique, fiercely fresh (but filling!) lunch. Just enough goodness to hold us over until dinner at ... Nomad Pizza! Stay tuned. power salad for votes, please!